St. Cross Clayton Repairs Project: Masonry Restoration Work to the external walls. St. Cross PCC have made the decision to apply for grants, primarily from Heritage Lottery Fund, towards the costs of the Masonry Repointing & Repairs Works highlighted by the Quinquennial Inspection. The PCC have also made the decision to install permanent disabled access into the church. Ian Lucas, our Architect, has completed a schedule of works and drawings illustrating the repair and new works which will be carried out in two distinct phases. we will, however, need to raise a significant amount ourselves to secure some of these grants, so we hope you will support our fundraising in the coming year. Further information can be found here. There are lots of services at St. Cross over Christmas including a Carol Service, led by our own Church Choir the St. Cross Singers, and a Crib Service, preformed by our Little Stars Sunday School children! Take a look at this page or our Facebook page to find out more about each service... everyone is welcome and we look forward to celebrating the joys of Christmas with you! ​After the success of our first Reverse Advent Calendar-style Foodbank Appeal last year, we are asking for your help to do it all again this year to give our Foodbank Families a special treat this Christmas! Read more about it all and how you can help here and visit our Fb event page. too! ​Our Christmas Fair will be the start of all things Christmas at St. Cross... come and join us on Saturday 1st December for a great afternoon of fun for all the family!! Read more about what will be happening here on our site or over on the Fb event page! Then on Wednesday the 5th we have our Deanery Dancing Christmas Tea Dance with a Bring & Share Buffet and dances suitable for all even if you've never been to the classes so do dust off those dancing shoes and come along and join us for some festive fun! Read more here. We will be running a joint Advent Course again this year, hosted by our neighbours, Church of the Resurrection. Read more here. Our second annual Pet Blessing Service will be on the 7th of October. Last year's service was a wonderful afternoon with 17 animals (and their humans!) in Church and we hope this year will be even better... read more about it here. Join us from 12-3pm for an afternoon event full of unique handmade gift ideas from local artisans... this is the perfect chance to get a head start on your Christmas List with some really special gifts!! Our Cafe will also be open, along with our ever-popular Cake Stall so come along for some lovely treats... read more about it here. ​Following an inspection by the Diocese, it has been decided that we need to begin work on re-pointing whole sections of the church’s exterior. We also aim to carry out repairs to the valley guttering as well as installing disabled access via one fixed ramp and two mobile ramps. We are currently attempting to secure funding for these projects... you can read more here. ​St. Cross, along with other local organisations, is currently involved in plans to re-open Barrington Street Community Centre as a hub for many activities which would benefit the wider community. These plans are at an early stage but a community consultation exercise is underway... to read more about the process and progress so far click here. On Sunday September 30th, we were presented with the Diocese of Manchester's Child Friendly Church Award and we celebrated the 1st birthday of our Sunday School in a very special Worship for Everyone Service... read more about it here! In September we will launch our fortnightly Sunday School. St Cross Sunday School will be coordinated jointly by Lisa Kimpton and Joanne Owens (recently co-opted onto the PCC) and they will be supported in delivering a programme by at least four other volunteers. The aim of the school will be to help children learn the whole bible- from Genesis to Revelation. Sessions will be delivered through a variety of activities, video clips, arts and crafts, songs, games and more and we hope that the school will give children the foundation for a lifetime of faith. Our Foodbank has gone from strength to strength and we are currently in communication with another agency which donates in-date food so that we may extend our provision. We continue to give our heartfelt thanks to Asda, McGee, as well as many individual members of the congregation who donate both food and money. Scripture is rich in passages which directly or indirectly emphasize the necessity of contributing towards the welfare of the needy and much of almsgiving given by members of St Cross is done discretely and cheerfully, such is the goodness and kindness of within our community. On a personal level, I wish to extend my heartfelt thanks to all who contribute to this vital outreach. As mentioned in my notices recently we are also planning to work with One Manchester in providing a group of volunteers to run a Community Grocer project in the Community Centre on Barrington Street. More information about this exciting project will be given out as and when I hear more. From October 6th 2017 until April 27th 2018, St Cross will work with the The Boaz Trust in running its first ever night shelter for destitute asylum seeking and refugee women. The Boas Trust has been running a men’s night shelter for nearly 10 years now, with the help of various churches over that time. The success of the men’s Boaz Night Shelter (BNS) will be the foundation upon which the women’s BNS will be built. St Cross will be one of seven churches to provide food, hospitality and accommodation nightly to 12 women for seven months, with St. Cross opening it's doors on Friday nights from early evening to 8am the following morning. The women will be provided with simple ground mats and sleeping bags. A hot meal will be provided each night, and breakfast will be available before departure. We are indebted to Joanne Owens who has also agreed to help coordinate this project with me. The shelter is only for destitute asylum seekers and refugees. Access is by referral only, from agreed agencies such as the Red Cross, Revive, Rainbow Haven, Cornerstone etc. All of the guests are assessed for suitability and it is hoped that while the women remain in the shelter, suitable move-on accommodation is found for them at some stage, and that the women be signposted for other needs such as dentists, GPs and solicitors. Co-ordination: Liaising with Boaz, co-ordinating volunteers. Reception: Being there to welcome the guests, helping with the meal and generally being around to chat. This is normally between 8.00pm(approx.) and 10pm. Cooking and serving the evening meal: this can be done on-site or the meal can be brought pre-cooked. Overnight supervision: Two volunteers are required to stay overnight. Breakfast: This can be done by the overnight volunteers or someone different. A simple breakfast of cereal/toast is usually sufficient. Driving: For locations further afield we need drivers to pick up the clients from the city centre in the early evening, and possibly some to drop them off in the morning. Laundry: Week to week, sleeping bag liners, pillow cases and towels need washed and returned ready for use. If you are interested in volunteering please speak to me (Fr Chris) or Joanne Owens. Holy Cross Day falls on Thursday Sep 14th. We will keep our patronal festival on Sunday September 17th. We will also host the wonderful choir Renaissance In Concert once again on the 16th (tickets £5- available in church soon). St Cross will also be open to the public, the weekend of the 9th and 10th September as part of the annual Heritage Open Days event. For more information about these events, please go to our Events page. And finally, it gives me great joy to announce that on October 29th 2017 at 3pm, St Cross will be holding a Pet Blessing Service. Our guest speaker for that service is Daryl Booth, the founder of Sarx ,a Christian animal welfare organisation which rightly encourages Christians to strive toward a world in which all animals are enabled to live with dignity, freedom and peace. Daryl will also be holding a Q&A session in the Lady Chapel after the service. I am praying that the church will be full to bursting with all of God’s wonderful creatures including my own two Isserley and Tommy, so let’s get the word out. On Saturday 22nd July, there will be a Fun run/walk/pram or wheelchair push. Registration is at Emmanuel Church at 10.30am, start time 11am and going five times around Gorton Park. Participants will be charged £1 for entering but you can be sponsored for any charity of your choice (including your church). Entrance and sponsor forms can be obtained from Fr Chris. Refreshments will be available throughout the morning. 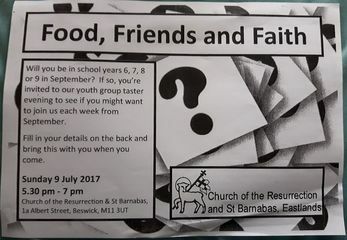 There is a youth group taster evening on Sunday 9th July, 5.30pm – 7pm at Church of the Resurrection & St Barnabas, Eastlands, 1a Albert Square, Beswick, M11 3UT. The Youth club is open to all those in Years 6 - 9 in September and will run weekly from September onwards. Application forms are available from St Cross Church. Please speak to Fr Chris. 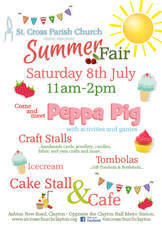 Our Summer Fair will be held in church on July 8th. We will have all the usual stalls as well as a visit from Peppa Pig and Marshall from Paw Patrol for the children... please come along! ​Having just come back from the press launch of ‘Heaven on Earth’, I cannot recommend it enough. Heaven on Earth is a brand new musical which uses state of the art digital technology, innovative staging and stunning choreography to tell the story of our salvation. Born out of years of prayer, it promises to be a moving and powerful piece of evangelism. The tour starts in Birmingham in December but comes to Manchester Arena for four nights (22-25 February 2018). To get discounted tickets (10% reduction), I must book by 25th June using a special code that I have been given. if you would like me to book you a ticket, could I please ask that you email me at christophermoore100@hotmail.com. The cheapest tickets are £19. And could I also encourage you to recommend this musical to friends and family, especially non-Christians. ​I will be mentioning this in church on Sunday as I know some of you have already expressed an interest. Greater Manchester Police Chief Constable Ian Hopkins visited St. Cross on Sunday 28th and asked us to place a message on our website. You can read this message and a response from Fr. Chris here. Following the terror attack in Manchester, St Cross was open this morning and will be open tomorrow (Wednesday) morning from 9am – 1.30pm for anyone wishing to light a candle and offer special prayers for the people of our city and for the families affected by this terrible attack. Prayers prepared by Fr. Chris can be found here. Following on from the ‘Meet Your MP’ Coffee Afternoon which took place on 3rd April 2017 (read more in the article directly below) I have received two letters from Lucy Powell. In her letters, she thanks the residents of Clayton for their attendance at the meeting. She writes that she shares the residents’ frustration and that she now has a very clear picture of the specific problems that need to be tackled – crime, litter, fly tipping, speeding, the state of the roads, anti-social behaviour and the controversial plans to introduce a residents’ parking scheme with charges for visitor permits. She makes it clear in her letter that she will oppose any proposals which made residents pay for an extra visitor’s pass and she is confident that the proposed charges will be dropped. She also writes that she has arranged an urgent meeting with various agencies including highways, enforcement and neighbourhood teams at the Council and the Police where she intends to make it clear what the problems are in the area and that a joint response to improve things for the residents is needed. Links with Seymour Road and Ravensbury School have been made. Two Year 1 classes from Seymour Road visited the church last week and there are four dates booked in May and June for Year 3 and 4 pupils from Ravensbury School to visit the church. We are also hoping to strengthen our current foodbank provision at church by having a donation bin at Asda and opening the foodbank to two schools in the parish on Saturday mornings between 10.30am and 12.00pm. Our plan is to work with the SEN caseworker/parental support workers at the schools to very vulnerable families as we are not sure at this stage how much food we will receive via Asda. 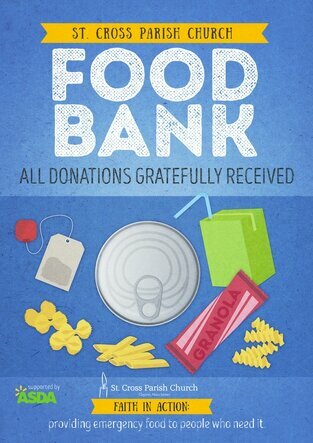 There will also be a bin placed at the back of church for any members of the congregation wishing to donate non-perishable food items such as tinned beans, soups, fish, meat as well as pasta, rice, UHT milk and sugar. Many residents were angry about being asked to purchase a parking permit at the cost of £45 and were apprehensive at the prospect of residential streets being flooded with cars because of overspill from the stadium. It was felt that the cost of this should not have to be borne by the residents of Clayton, who, through no fault of their own, found themselves the victims of commuter parking. Many felt that the system was unfair and open to being abused. Lucy Powell MP agreed. She assured residents that the council had been asked to look at others ways of funding the scheme and she was confident that the proposed charges would be dropped. Residents were angry at the amount of litter build up in the streets, the reduction in the size of bins and the infrequency with which waste was being collected. Lucy Powell reported that half-a-million pounds was cut from the street cleaning budget and half of the borough's 36 road sweepers were removed. Because of this, hundreds of streets across the borough, including in Clayton, are now only cleaned once a month, rather than every fortnight as they were. She stated that the size of household waste collection bins was reduced to encourage people to recycle correctly and that more Recycling Enforcement officers were needed to ensure that residents were complying with the rules. LP sympathised with residents who felt frustrated by council bin men who left bags behind or who littered the streets when transferring rubbish into lorries. LP explained that councils were under pressure from contractors who are charged when landfill quotas were exceeded. Residents raised concerns about antisocial behaviour which included violence against shops and public transport, speeding vehicles and the number of youths carrying offensive weapons including knives and firearms. LP assured residents that she had repeatedly taken this issue up with the police and that she has been told the number of police on the streets would be increased. She promised to take the matter up again with the police. LP explained that there were certain types of road onto which fixed speed cameras could not be installed. LP also assured residents that after a lot of stalling the regeneration programme, especially around Ben Street, will restart later this year. She is also pushing for a Landlord Licensing Scheme to ensure that privately rented housing is brought up to the same standard as Social Housing. It was also mentioned that Mick Loughman and Donna Ludford, Ancoats and Clayton Councillors will be starting a surgery in Clayton, the first of which will take place in the Wells Centre, North Road on April 13th. The concerns expressed at this meeting will help us to think about how we might become more of a visible presence in the local area and how we might make a difference in the community through practical support and projects.